Skills required - Knit, Pearl, knit 3 together (K3 tog), pick up and knit, 2 needle cast on. All are easy enough to do and if you are not sure, lots of examples are shown on youtube. With domino knitting, so long as you have an odd number, it will work. For this baby blanket, I started with casting on 41 stitches in the white. Using the shortened code (the letters in bold above) create your first square. 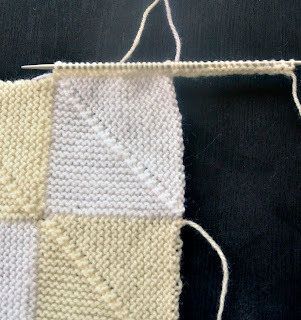 continue with this pattern (k one less either side of the k3 tog on each odd row) until you are left with 1 stitch, snip the yarn about 10cm or where you are comfortable, and thread through last stitch, pull. 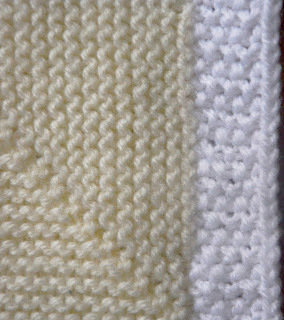 Now that you have 1 square, to create the second square, change colour to the cream, pick up and knit (i.e place the needle into a space, wrap yarn over needle and pull it through the space, therefore creating a stitch on your needle) along the left side of the square you have just created until you have 20 picked up stitches, cast on 21 stitches (41 in total). Knit one row. Follow the main pattern. 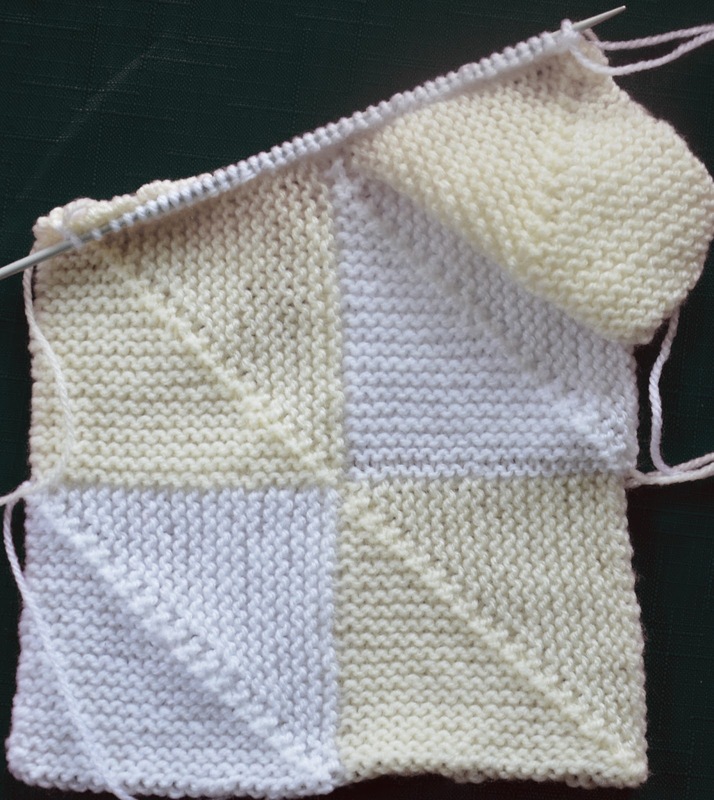 For the third square, continue with the cream, cast on 21 stitches, pick up and knit 20 along the top edge of your first square, knit one row and follow main pattern. For the fourth square, pick up and knit 21 along the left side of the third square in white and 20 stitches along the top of the second square. K one row, follow the main pattern. You will soon discover a ridge running from the bottom right hand corner to the top left corner and that the direction i.e the weft and warp of the stitches run in different directions making this a strong blanket. I have numbered each square in the order you may want to follow. Squares 3,5,7,9,11 and 13 running along the right hand side of the blanket will need 21 stitches cast on before picking up the other 20 on the square underneath. 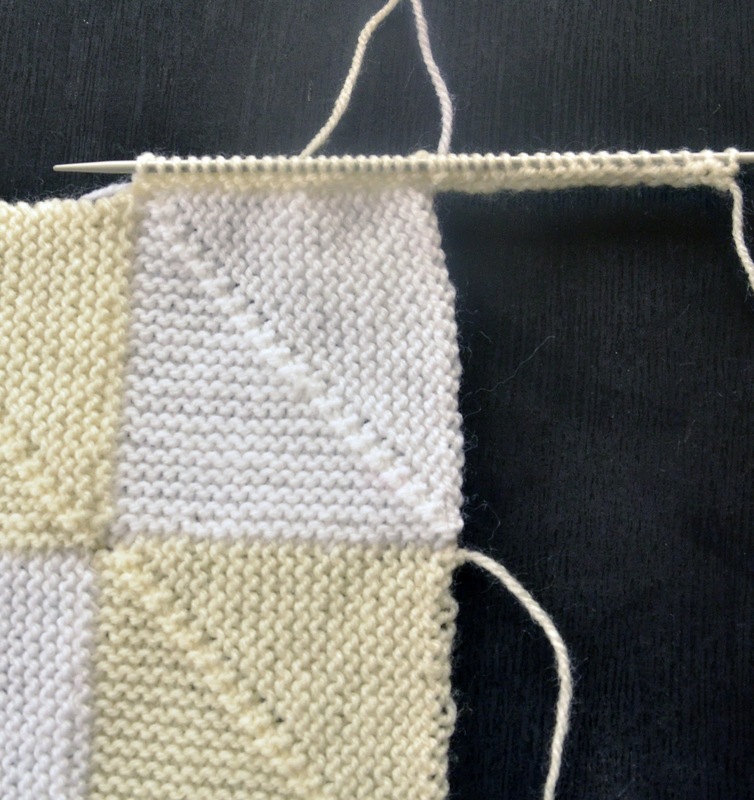 Squares 2,15,17 and 29 require you to pick up and knit 20 before casting on 21. All of the other squares require pick up and knits along the corresponding squares. 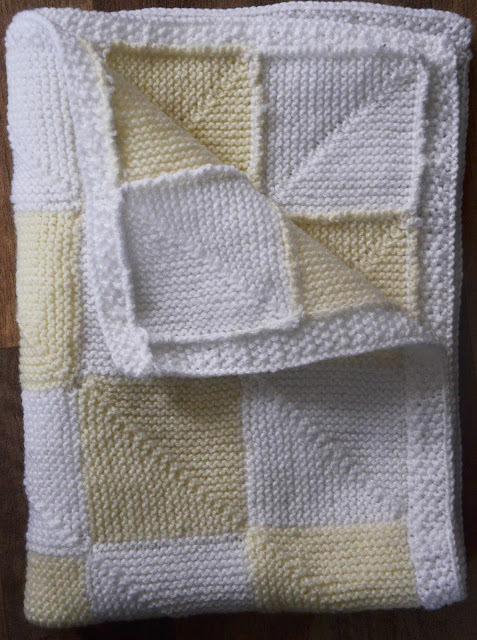 This blanket is great to do in between other projects as it's a bit of a gym work out for your fingers and quite repetitive which suits whilst watching telly or having a good natter at your craft group. 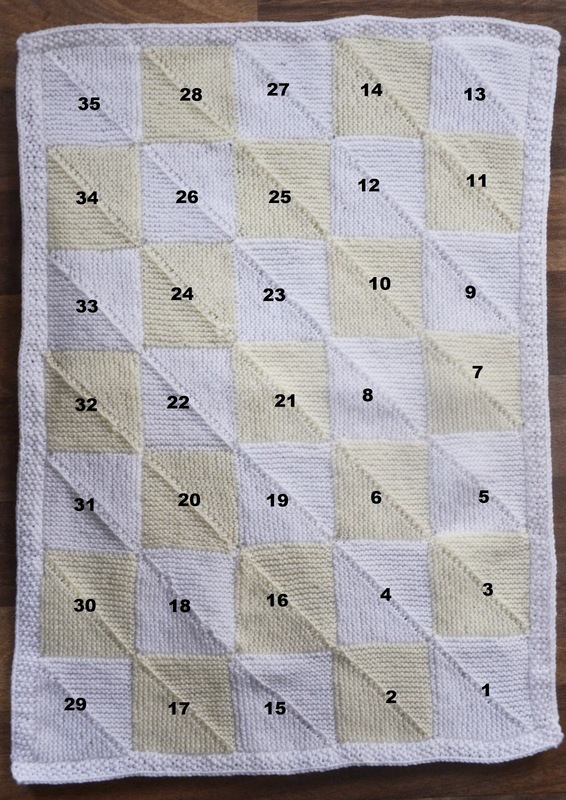 When you've made all 35 squares, using the white, pick up and knit along the long side of the blanket (it means squishing the stitches/blanket closely on the needle). Knit 1, pearl 1 all the way along. If you end the row on a knit, start the next row with a knit - if you end the row on a pearl, start the next row on a pearl. This is the moss stitch. Make several rows measuring as you go along (18" across with the other side included). Cast off. Repeat for the other long edge of the blanket to measure an equal amount of the moss stitch rows to the other side and so that the blanket measures 18 inches across. 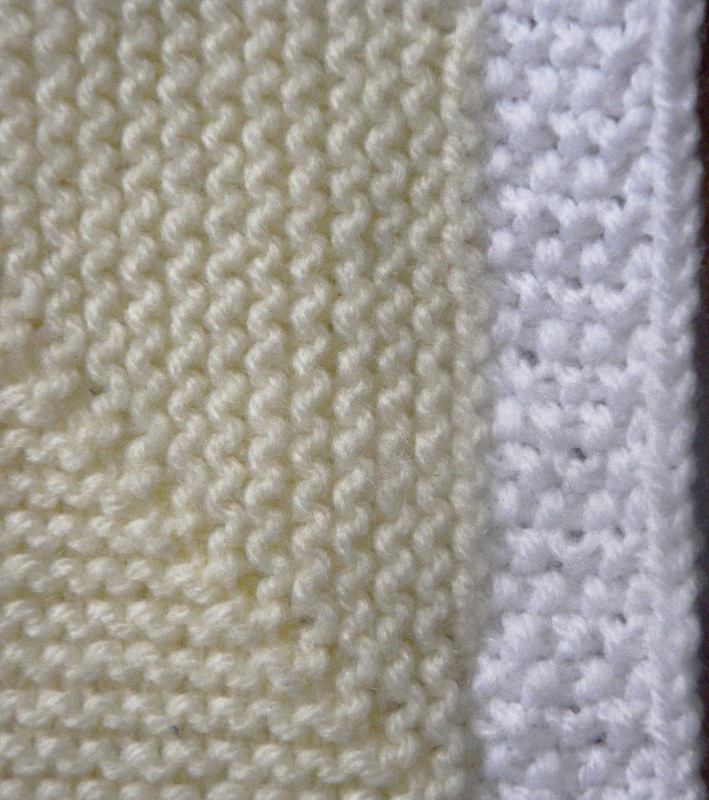 Pick up and knit along the top of the blanket, make several rows with the moss stitch. Repeat for the bottom edge making sure to make equal rows as the top and for the length to measure 24". An alternative would be to cast on several stitches, do the moss stitch for required length and sew onto the relevent edge. With a yarn needle, sew in all ends into the ridges created on the wrong side. Donate to a family member or to a charity! Lovely blanket, thanks for the beautiful pattern, only I would never recommend acrylic yarn for a baby blanket! If this burns it spreads a dangerous gas which harms your breathing! Never, never use acrylic, please. There are plenty much better alternatives! The reason you use acrylic is because it is washable at all temperatures and wears so much better and hospitals can wash them at high temperatures and they don't damage. The chances of a baby blanket catching fire are so minimal! How would I make it bigger? coud you play a video for this pattern,I am confused.Trudi.